Box beat expectations for revenue and earnings in its most recent quarter, but several other metrics gave investors cause for concern. Cloud content management company Box (NYSE:BOX) recently kicked off its fiscal 2019 year with a seemingly strong quarter, beating both revenue and earnings expectations. Still, the market sent Box's shares lower after its earnings release, as several other key metrics underwhelmed. Box has still had a great year though, with its stock surging 25% year-to-date. So, was the recent sell-off merely due to profit-taking, or is the long-term bull thesis now in danger? Much of Box's recent gains came in May, when Social Capital CEO Chamath Palihapitiya pitched Box as his best idea at the New York Sohn Investment Conference. His bull thesis is that Box's content management software has acheived a critical mass in leading enterprises, and that Box now has the opportunity to sell valuable artificial intelligence add-on services to these same enterprise customers over time. So while the current quarter came in strong -- revenue grew 19.9% and adjusted net loss per share came in a ($0.07), both beating expectations -- guidance might have left some wanting. The company did increase FY 2019 guidance by $1 million to a range of $603-$608 million, but that was only within analysts' expectations of $605.7 million. When you've had a run like Box has had, only guiding within expectations isn't going to cut it. Moreover, the tepid guidance could suggest the "add-on service" thesis may be overblown, or at least premature. In addition to guidance concerns, there were actually a few important metrics that came in light even during the quarter. For instance, billings -- which means total revenue growth plus the change in deferred revenue-- came in at only 17%, below overall revenue growth. An accounting rule change affected that number by about three percentage points, so without the change, billings would have increased in the low 20% range. Of course, the accounting change also affected revenue as well. The important thing is that billings growth came in below revenue growth. For software companies, when billings falls below revenue growth, it suggests the business could potentially be losing momentum. Is Box's growth a concern? Image source: Getty Images. Another important metric to monitor for software companies is gross margin. Usually, gross margin grows or remains stable as a software business scales, but in the recent quarter, Box's gross margin actually declined to 74.4%, down from 74.5% last year, and down from an even higher 76.2% in the previous quarter. Box management attributed the shortfall to increased investment in its data center footprint to support future growth, but the lower number likely caused some investors to question Box's ultimate profitability. Finally, Box's net expansion rate, which means how much money current customers spent with Box versus one year ago (the software equivalent of same store sales), also underwhelmed. That number came in at 109% this quarter (13% expansion, with 4% churn). While that's a solid number, it also marks a deceleration from the 117%, 115%, and 110% figures the company posted in its 2016, 2017, and 2018 fiscal years, respectively. On the call with analysts, Box CEO Aaron Levie disclosed the company's ongoing target would be 108%-100% going forward. Palihapitiya mentioned he thinks Box can grow 20%-25% for the next 10 years. But with this quarter's growth coming in at the low end of that figure, and with this year's guidance only projecting another 20%, it certainly seems like a tall task to keep up those rates up for another entire decade. In addition, the underwhelming billings, net expansion, and gross margin rates likely didn't help matters. Going forward, Box shareholders must put their faith in management to accelerate growth beyond this year. That's a tall task, especially as the company gets bigger. 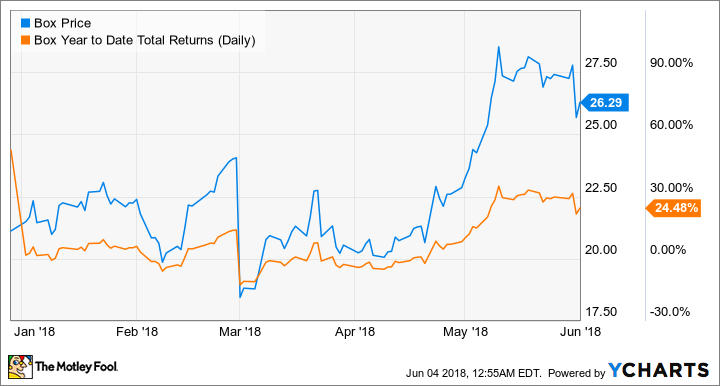 Absent a big new product launch to accelerate gorwth, it seems to me that Box's impressive year-to-date performance is in for a pause at the very least, or even a bigger potential pullback.